A few years ago while traveling to Connecticut I came across a book written by James W. Douglass, “JFK and The Unspeakable, Why He Died and What It Matters”. At the time I thought it was just another book with more of the same worn-out conclusions. I had no interest in reading it. It wasn’t until recently when I came across an interview given by Lew Rockwell, that my interest in this book reached a renewed level of curiosity. Reading JFK and The Unspeakable prompted me to write to you today. Mr. Douglass taps into an entirely different approach. His approach is less about “who” pulled the trigger and more about “why” citizen denial overwhelming took hold of our nation’s mindset, in addition to the role of government’s plausible deniability, and how these elements allowed the unspeakable to occur. Citizen denial is a term that should be easy to understand. The difficulty is to determine whether citizen denial was the mindset in 1963 and whether it is our mindset today. Plausible deniability is a term coined by the CIA during the Kennedy administration. It is a term used to describe the withholding of information from senior officials in order to protect them from repercussions in the event that illegal or unpopular activities by the CIA became public knowledge. Does the lack of evidence make the denial plausible, meaning that it then becomes, credible? Is plausible deniability a tactic used by the CIA today? Mr. Douglass wants us to consider whether the unspeakable succeeded due to citizen denial, because the truth was hidden from us due to plausible deniability by government agencies. He presents a compelling argument that President Kennedy was assassinated by unspeakable forces, and he provides highly detailed and intricately linked evidence based on his own research and a vast array of some of the best scholarship. In some ways Mr. Douglass actually extends the borderline and opens news paths. One of the things that makes this book instructive and worthy of reading is that Mr. Douglass is able to achieve an amazingly different view through the use of new sources, or through sources that were never used, underused, or simply not available. His years of scholarship, along with fresh interviews and access to White House memos only released in the mid-1990’s, prompted Gaeton Fonzi, former staff investigator for the U.S. House Select Committee on Assassinations, to write that JFK and The Unspeakable is “by far the most important book yet written on the subject.” Mr. Douglass meticulously documents his sources. There are nearly 100 pages of documentation. While it is important to examine the terminology and circumstances that Mr. Douglass talks about, at the crux of his book is the sequence of steps that transformed JFK from a Cold Warrior to someone determined to pull us back from the brink of nuclear war. Even today, too few of us realize that President Kennedy was fully immersed in a perilous battle toward peaceful negotiations with all nations, including a back-channel dialogue with Soviet Premier Nikita Khrushchev. Every hypothesis, particularly when it is backed by recently released information needs to be considered. Unmasking the truth is crucial. Otherwise, we run the risk of not considering this tragic event in relation to current events, regardless of who sits in the White House. Historical truth is essential to our understanding, but equally important is Douglass’ dissection of the actions of those in power during the 1950’s and ’60’s in both domestic and international politics. Kennedy, he posits, began as a Cold Warrior committed to Pax Americana secured through superior nuclear military might. But the near cataclysmic disaster of the Cuban Missile Crisis and the isolation Kennedy experienced from his own military advisers forced him to reach out for help both publicly and in secret back-channel memoos to his greatest enemy: Soviet leader Nikita Khrushchev. Kennedy had what some leaders might call a conversion. He turned toward peace. When the enemy is seen as human, everything changes. This conversion locked Kennedy into a death spiral with the military industrial complex and the CIA. They now considered JFK a traitor because he reached out to Khrushchev in peace, and because the CIA and the military industrial complex were fanatically committed to what General Curtis E. LeMay described as, “Pax Atomica,” the annihilation of America’s enemies through nuclear war. Kennedy showcased his new vision in June 1963 during a speech (see below link) at American University in Washington, D.C., by advocating the absolute necessity for nations to choose peace. “What kind of peace do I mean?” asked Kennedy. “Not a Pax Americana enforced on the world by American weapons of war. Not the peace of the grave or the security of the slave. I am talking about genuine peace, the kind of peace that makes life on earth worth living …“ He spoke of his intentions to establish a Nuclear Test Ban Treaty and he acknowledged the Russian people wanted peace as much as the American people. It was this speech, Mr. Douglass says, that prompted “The Unspeakable” in the form of people within the U.S. inttelligence and the military industrial complex to act. Mr. Douglass tells us that Kennedy was well aware of his enemies and he was well aware of the dangers facing him. He tells the story that, until now, I don’t think America was ready to hear. It’s an old story of “prophets, kings and consequences”. It’s a story of how President Kennedy nearly started a nuclear war then turned toward peace with the enemy who almost started it with him It’s our story it desperately needs to be remembered and never forgotten. Donna Coe [send her mail]. 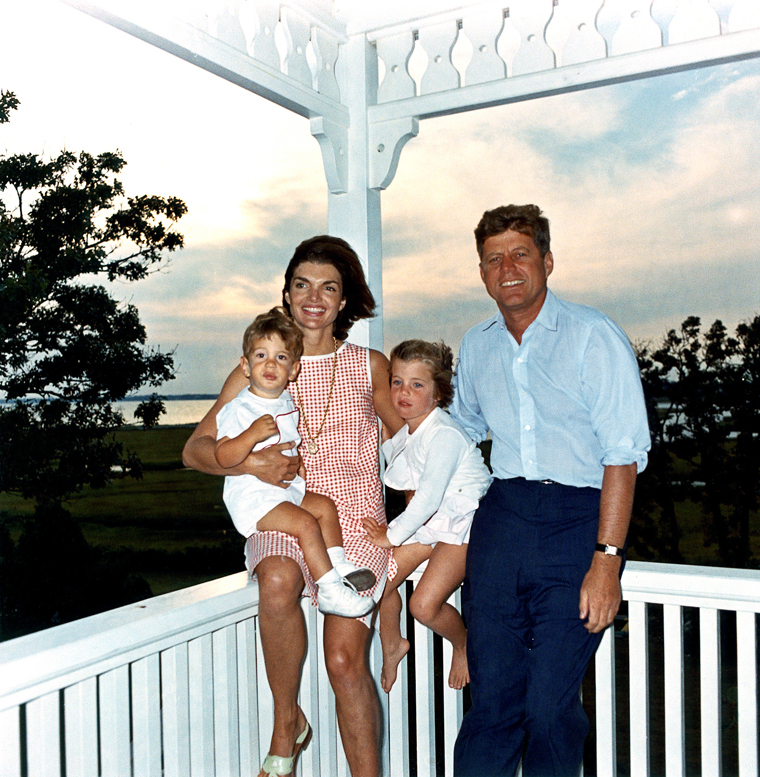 (1) President John F. Kennedy, First Lady Jacqueline Kennedy, and their children John, Jr. and Caroline, at their summer house in Hyannis Port, Massachusetts. –This work is in the public domain in the United States because it is a work prepared by an officer or employee of the United States Government as part of that person’s official duties under the terms of Title 17, Chapter 1, Section 105 of the US Code. This entry was posted in Geopolitics, History and tagged conversion, James W. Douglass, JFK, Kennedy, peace, the unspeakable by cnlib. Bookmark the permalink.